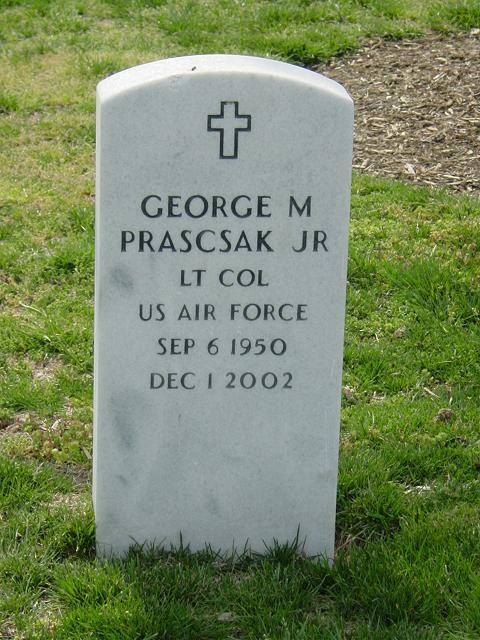 Lieutenant Colonel George M. Prascsak Jr., assigned to the Operation Prevention Division, Air Force Medical Operations Agency, Office of the Surgeon General, passed away suddenly on the evening of December 1, 2002. Prascsak was the Chief of Public Health Operations. Colonel Prascsak was born in Braddock, Pennsylvania, on September 6, 1950. Upon graduation from Middletown High School, New Jersey, in 1968. he enrolled at Ashland College in Ashland, Ohio. He enlisted in the Air Force in February 1971 and attended basic military training at Lackland Air Force Base, Texas. Following basic training, he attended technical school at Sheppard Air Force Base, Texas, where he was trained as a medical technician. His first assignment was at Wright-Patterson Air Force Base, Ohio, from 1971-1975, where he worked in the pediatric clinic. While assigned at Wright-Patterson, he achieved the rank of Staff Sergeant before separating from active duty to pursue his education and joining the Air Reserves. While in the Reserves, he attended Wright State University, earning a bachelor's of science degree in environmental health. Upon graduation, he was discharged from the Reserves and accepted a position with the Red Bank City Department of Health in Red Bank, New Jersey. In 1979, he and his family moved to Ohio where began work with the Ohio Department of Health. During this time, he rejoined the Air Reserves and was commissioned as a Second Lieutenant. In 1988, while on a medical mission in Honduras with the Reserves, he was offered an active duty commission as an environmental health officer that he quickly accepted. He was assigned to Wurtsmith Air Force Base, Michigan, until 1991, when he transferred to Okinawa, Japan. From 1994-1997, he was assigned to the U.S. School of Aerospace Medicine as a public health instructor where he developed and taught the public health concept of operations course. Upon completing this assignment, he earned his master's of public health degree from the Uniformed Services School of Health Sciences. Upon graduation, he was transferred to the 51st Medical Group, Hickam Air Force Base, Hawaii. This assignment was curtailed to bring him to the Air Force Medical Operations Agency where he worked on food security, force protection, biological warfare defense and other readiness issues. Colonel Prascsak is survived by his wife Carol; his mother, Olga Prascsak; sons George Michael Prascsak, III of Las Vegas, Nevada; Ken Prascsak of Hollywood, California; a daughter, Suzy Fowler of Fort Campbell, Kentucky; grandchildren Brandon Prascsak, Michael Prascsak, Joey Fowler, Lilly Fowler; sisters Sandra Castles, Catherine Potaczek; brothers Wayne and Barry; son-in-law Army Sergeant Nathan Fowler, assigned to the 101st Airborne Division; daughter-in-law Leslie Prascsak; uncle William Priatco; and mother and father-in-law Ken and Marianne Seeley of Columbus, Ohio. He was preceded in death by his father, George Michael Prascsak. His wife Carol works for the Secretary of the Air Force, Office of Financial Management, Budget Investment, Military Construction. His uncle,William Priatco, served in the Air Force Presidential Honor Guard and played for the Bolling Generals before being drafted by the Pittsburgh Steelers. He will be laid to rest with full military honors at Arlington National Cemetery on Wednesday, December 18, 2003,at 9 a.m. Family and friends are asked to meet at the Arlington National Cemetery Administration Building at 8:30 a.m.